Between you and me, I just got to know Colleen on a more personal level...yesterday. She has been my younger sister's friend for years and years, but it was only recently that our worlds collided. And this girl's story has rocked my perspective and deepened my hope. Colleen had a heart transplant when she was a mere three years old...and now she waits in the hospital for a retransplant, after 17 years being sustained by her current heart. This is where I stop and allow Colleen's own words to share Christ's power and love. She has touched my soul so deeply, and we hope and pray that her story and words challenge your perspective and allow you to praise God more fully for Who He Is. Tell us your story, Colleen. I guess my story begins when I was younger. I was born in heart failure due to dilated cardiomyopathy. It runs on my mom's side of the family and my namesake, my Aunt Colleen, actually passed away on the waiting list for a heart transplant when she was 21. I was put on some meds to stabilize my heart and sent home. My doctors knew I was going to need a heart transplant eventually, but wanted to put it off until I was bigger and more grown up. When I was three, that time came and I was transplanted on January 20th, 1996 (my heart birthday, as we call it in my family!) Since then, I've been healthy and only had one instance of rejection in over 16 years post rejection. That one instance was my biggest life changer and what brought me to Christ. I was so broken up about getting rejection and nothing and no one could comfort me. After years of calling myself an agnostic, I said my first prayer and found a peace I didn't know possible. Since then, I have tried my best to shape my life in the way Christ has led me to. His path is by far the best path! So that brings us to where I am today! I came into the hospital a little over two weeks ago with shortness of breath after not being able to make it to a class that was a mere three minute walk away. I, very naively, thought I'd be in and out in three days. HA! A few hours after arriving at the ER in Chicago, they told me there was a possibility I may have developed Transplant Coronary Artery Disease which is typically seen in transplant patients, especially those as far out as I am (I'll be 17 years out in January!) They said usually they can give meds to stabilize and sometimes reverse it so I remained hopeful. They did warn that the only true cure was a retransplant and that if I had it, even if it could be stabilized now, I would one day down the road need a retransplant anyway. The next day, following a cardiac catheterization to figure out if that was the case, they broke the news that I had developed it, for whatever reason, so quickly, that I was already at the stage of needing a retransplant. So much for the three day stay I had planned for! Haha. I was put on the waiting list for my second transplant the next week and now here I am! I've been staying very positive through the whole process and I trust in Him. Everyone keeps asking "how are you still so smiley? Why are you so happy? Why haven't you complained?" My answer each time is that God has everything taken care of and I trust Him and His plan. He has lead me to a path I know I have to follow and it extends past the hospital. I can confidently say I will be getting a heart, so why worry? I have seen so many positive things already happening from this and I am so excited what else He has in store. I've already been able to talk to my cardiologist about trusting in the Lord (she said she couldn't understand how I could be so ok with this after so many complication-free years...and the answer was God again!). I've seen people come to Christ in ways that I don't think they ever have or have in a long time. People have been really looking at their own lives from a new perspective. I want God to squeeze every last bit of this situation out through me to touch as many people as possible. I have been given such a rare and wonderful opportunity to inspire people and bring them to Christ. How can I not be happy about that? To give the gift of Christ to the people I care most about is the most wonderful thing I will ever be able to do. If God wants me sitting here for awhile in order to do that, so be it. It's a wait I would gladly be a part of. Many people are praying I get a transplant like next week, but honestly, I am here and willing so I want God to use me for as long as He needs. What has God been teaching you during this time? Patience, to stop trying to plan when He already has that covered, and that the world is a much better place than people seem to think. I have always been a busy person with a packed schedule who has things done at a specific time and that's that. Right now, my future is so uncertain and there is no way to plan anything. I have to be more patient with everything. My new heart could arrive tomorrow or it could arrive in 9 months. I just don't know. God has really been teaching me to stop planning everything all the time. Right now, I'm just living each day individually as is. God will show me what I need to do. He'll show me who I need to talk to or what I need to write about. I've handed over my time to Him and I hope to continue that once I am out and have that chance to pick and choose what I do again. Lastly, so many people have come to me with messages of hope that I never expected to speak to. So many people I haven't even talked to in years have sent me things. I have always been a firm believer that the world is full of wonderful people and that everyone is good. This situation has more than affirmed that. What would you say to encourage others who are enduring hardship? It's temporary and if you have Christ, you cannot even fathom the amount of strength He is able to give to you in order to get through it. God has strengthened me in ways I didn't even think possible. I've been the one consoling others about my situation while sitting in my own hospital bed! Haha. He is the One who is able to plant such wonderful, beautiful seeds of happy thoughts and you need to only water them. Through any hardship, you are becoming stronger. God is working in you through that hardship and His grace is working miracles in you. You may not notice them. You may not feel them. I promise they are there. It took me years to find the positive in my first transplant. I was angry at God for so long for putting me through and then I chose to not believe in Him because of it. It took me 13 years after my transplant to see that it was the greatest blessing God ever gave me. Now God is giving me that same blessing. Never discount your hardships as something terrible. The ways in which you can grow from them may show you that they were the greatest blessings of all. Look for those blessings in any hard situation. Is there Scripture that brings you joy, or a passage that focuses you on God? I have a whole document filled with bible verses that I regularly go over, but here are a few of my favorites! How specifically can we all be praying during this time? I ask that you please pray first and foremost for my future donor and his/her family. Pray he/she prepares to enter the Kingdom of God and loves abundantly and that his/her family loves abundantly in return. Please also pray for all the kids in my hospital and especially those on my floor. There is so much sickness here, but there is also so much hope! Please pray for these sick kids and their families during this time. Lastly, please pray for my family and friends who may be struggling with this situation. Pray they find the peace and strength I have found only through Christ. Pray they all stay positive and know this is in God's hands and He is going to continue His blessings through this whole process and beyond it! 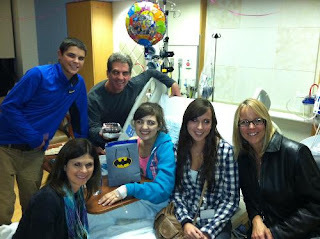 Read/Comment on Colleen's CaringBridge blog here! She would love to hear from you. And please continue to pray pray pray. You can also donate to Colleen's fund here (here is a link for organ donors, too...). We love you, Colleen, and consider it a privilege to join you in prayer, in the mighty power of Christ, Who can do immensely more than we could ever ask or imagine!